Once again, this is the drawing I did initially, to put this into practice…. And this is the first go at painting the scene…. 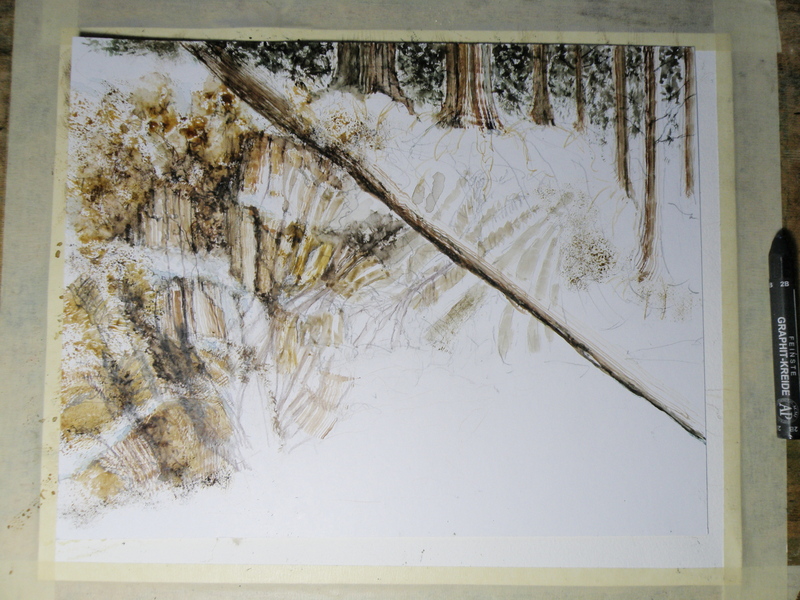 And now today, here is the progress so far, attempting to locate some visual interest at each of the four intersections within the piece, the barn being the first and the pine being the second and the creekbed being the third….. The darkest darks and greatest contrast will remain with the barn, for that is the intended focus for the picture, when completed. The ‘rule of thirds’, as stated above, holds that generally two-thirds of a landscape be devoted to the sky, with one-third given to the land below (the sky being such a vast and dominant feature). In this case two-thirds is dedicated to the land and a very high horizon means that the one third is devoted to the sky area. Because watercolour basically amounts to taking white paper and staining it with various colours by way of a brush and water-activated pigments, the possibility of texture using a buildup of paint, gesso, gel medium and other ‘helps’ available to painters in acrylic and oil just isn’t there. IOW, in classic watercolour technique the word ‘impasto’ doesn’t exist. Some painters get around this disadvantage by way of collage, and apply watercolour to glued on tissue and similar textural material….. 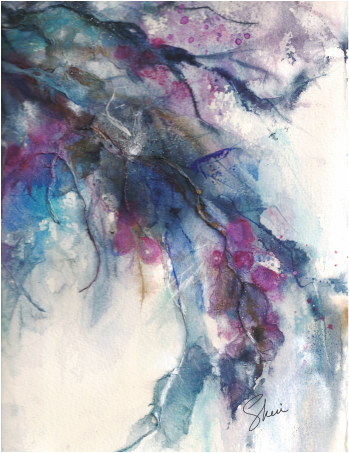 Here, the painter, Sheri (Colours by Sheri), used ‘delicate papers’ as a glued foundation to provide textures which then received watercolour paint to complete the effect. On her site she describes how she also has used organic leaf material at times. 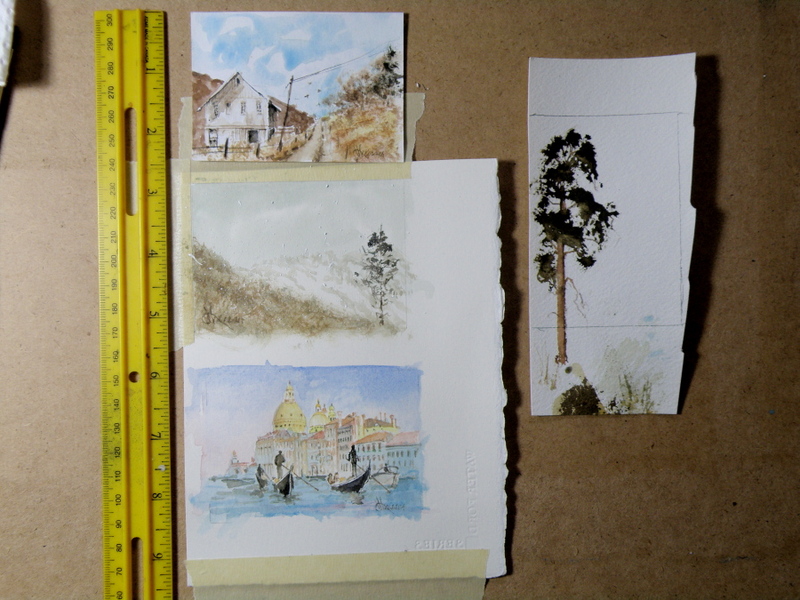 If this method is used, painters are required to identify their medium as ‘collage’, or ‘watercolour collage’ if entering the piece in an exhibition or juried show. Such work falls outside the accepted boundaries of what constitutes a ‘watercolour’. In order to remain within the rather strict boundaries painters cannot have more than one third be of another medium or it then becomes a ‘mixed media’ work or ‘collage’ or ‘gauche’. Gauche is watercolour which uses white tempera paint, and thus is opaque, not transparent. Of course, that is perfectly well and good. Every painter does as (s)he is led to do. Personally, like writers who enjoy the challenge of staying within the bounds of iambic pentameter and composing 14 line sonnets, being ‘confined’ to the rather strict parameters of traditional watercolour is rewarding. 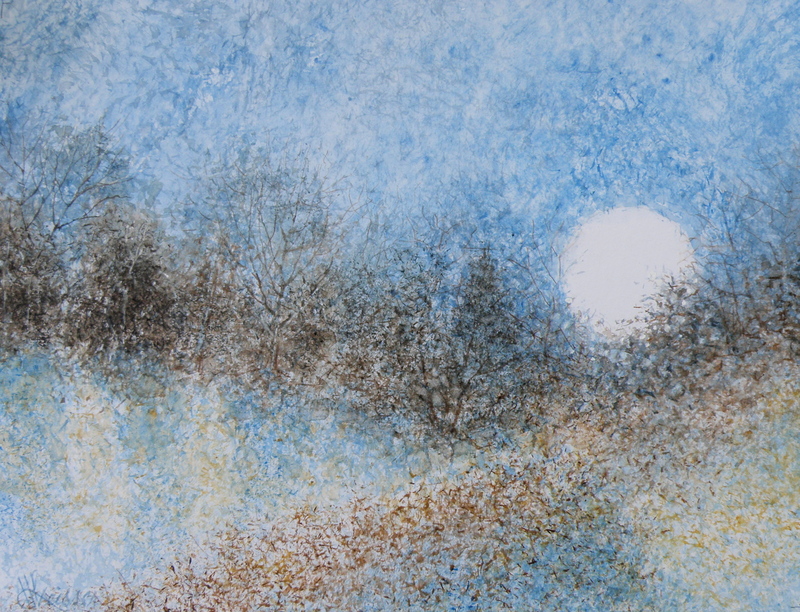 These protocols include reserving paper to serve as white in a painting (such as the moon in the above example) — and the white of the paper is what brings life to the pigments laid over it. And it means having to discover ways of creating texture which, in the end, remains just an illusion. THE COMMON RAVEN is amply represented in British Columbia and enjoys the distinction of co-existing with people for thousands of years, to the point where–in Haida Nation tradition–the Raven has god-like qualities. It was the Raven which released the Sun from its little box–made the stars and moon–and even brought people out of the earth in order to populate a party being thrown. But in traditional stories Raven doesn’t actually create (make things out of nothing), so much as steal, exchange, rearrange and redistribute and generally push things around into new combinations. If that isn’t humanlike, I don’t know what is, lol. In Kamloops it is against the law to feed them, as well as crows. A buyer of my work named Joan pours bags of cat kibble into her elaborate and large cement bird baths in the Winter and revels in their continuous, noisy presence. The neighbours? not so much. When they report her, she just pays the fine and keeps at it. 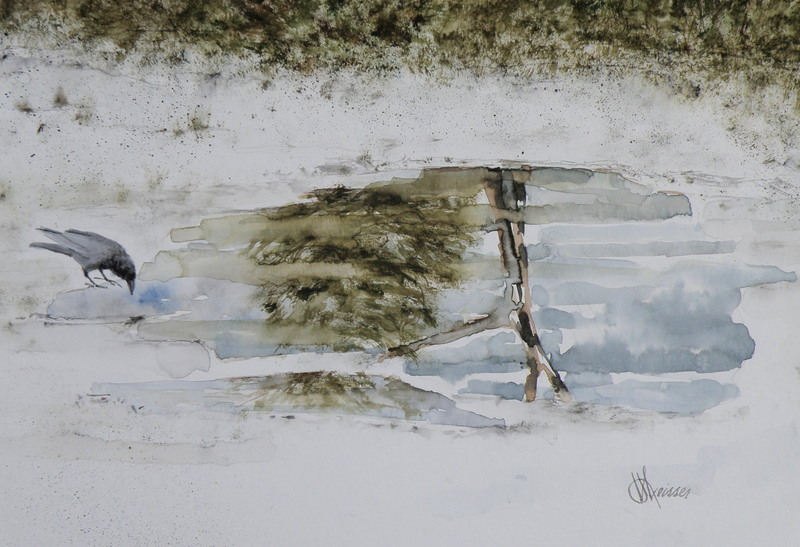 A FEW LAST COMMENTS about this painting…..there is a decided difference between nature and the art of depicting nature. Mother Nature is not only a hoarder, but not interested in housekeeping nor pruning, encapsulating, or boiling-down. She wants it all, all the time, and enjoys lavishing on us the plentitude of what happens when everything we look at, at any given moment, reproduces at will and overwhelms us with dozens–and even thousands–of itself. 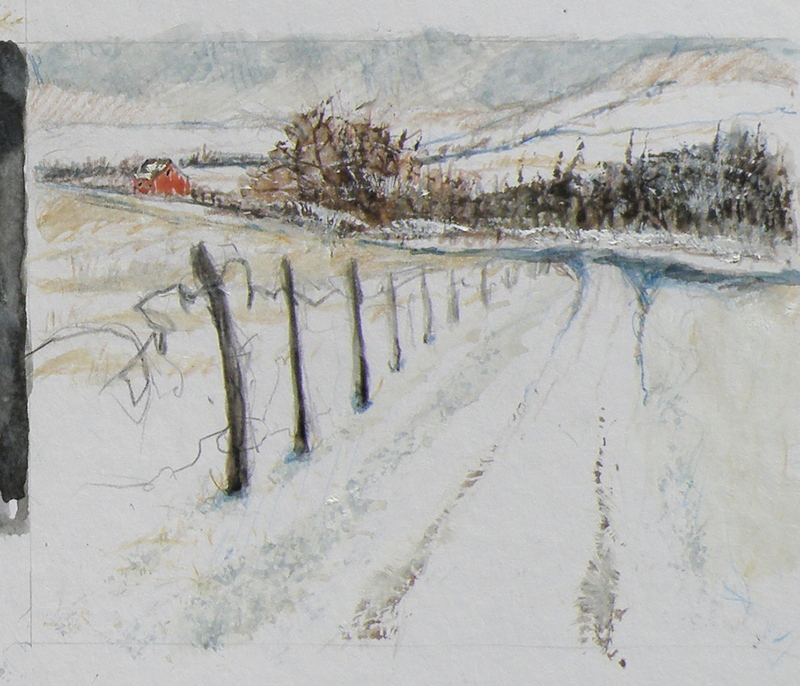 FOR THE LANDSCAPE PAINTER the challenge, always, is to take Nature and make it into Art. It is the very human discipline of paring down, re-arranging, configuring and composing. What separates raw Nature from the art of painting is having a limited space, with only two dimensions, which is ultimately going to end up on a wall inside a human-made space. That restrictiveness requires moving trees and clouds and birds about in order to have a sense of balance or sense of wonder or sense of drama. It means the painter must dare to alter time itself, put limits on colour, and restrict amounts of what is naturally before the painter’s eyes. MAKING ART is similar to the difference between looking at a field of wheat and sitting down to a loaf of freshly-baked bread. What happens between those two events is the act of altering something to create something else. THIS PAINTING is not what the photograph of this scene looks like. For many years I struggled with whether I was ‘allowed’ as a painter to do anything other than depict Nature as it presented itself to me. Sitting out on some stoney ground, I would suddenly find myself slavishly working at painting the weeds between cracks of rock, then painting the seed heads on the weeds to look exactly like what my eyes saw, when really I knew the larger purpose of sitting there in the hot sun was not to pay attention to weeds, but to paint the distant mountains above and beyond them. By the time I’d gotten away from doing weeds justice, I was so hot I had to fold up my equipment and go back to the car. 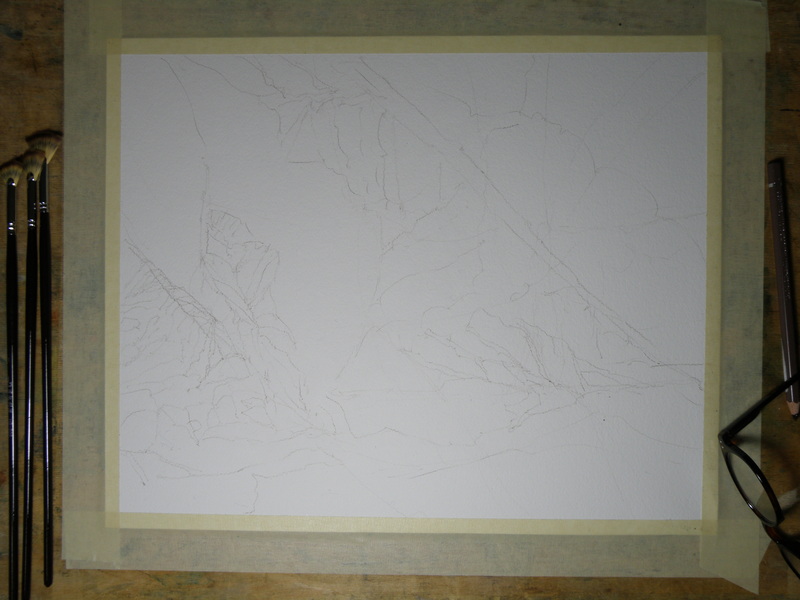 And I went home with a painting of weeds between rocks and a big expanse of white paper above them. THAT DOESN’T HAPPEN ANYMORE. I have learned that I must take what is presented to me and do with it as I wish to do. That is the work of a painter. A PHOTOGRAPHER has a whole different set of challenges because a lens is very different from a human eye (it can’t do half of what a living, ‘breathing’ eye can do) and from human imagination (once it has seen what is before the eye) . But I have noticed some irony happening between the worlds of photography and painting. In the past, painters often worked very diligently to make a painting ‘look like’ a photograph. These days, with technological photo-shopping manipulation, a photographer seems more or less obsessed with trying to make a photograph look like a painting. I am not convinced either enterprise is worth spending all that amount of time on. IF A PAINTER WISHES TO BE A PHOTOGRAPHER, then don’t go trying to make a painting into a photograph. Do go and take courses and buy equipment and learn how to take photographs and do the work a photographer must work at in order to eventually become a photographer. And IF A PHOTOGRAPHER WISHES TO BE A PAINTER, then leave the photo-shopping manipulation apps alone and do take courses and buy equipment and learn how to paint paintings and do the work a painter must work at in order to eventually become a painter. They are two distinctly separate and inherently different artforms and–in my flawed way of viewing things–should stay that way. AND YOU…what’s your view? Tell me how I’m missing things you’ve discovered! 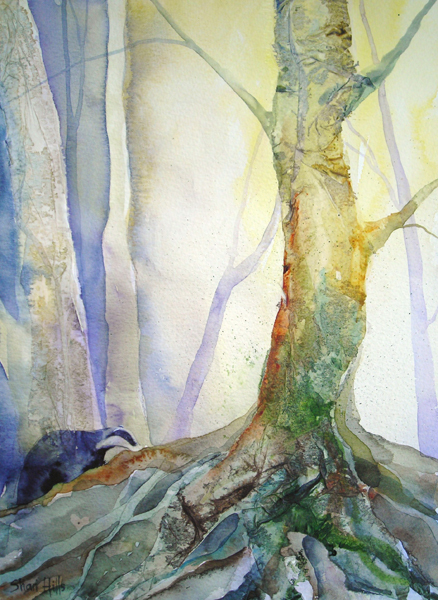 BECAUSE WATERCOLOUR is such a watery, transparent, delicate medium–one which must always allow the paper it’s laid on top of to breathe through it–one which traditionally doesn’t use white pigment, but relies on the paper to be the white of the painting–BECAUSE of this (and more) the challenge of the watercolour student is to convey an illusion of texture, without the ability to actually build up a surface texture. WERE WATERCOLOUR PIGMENT applied so thickly as to create an impasto-like texture on the paper beneath, it would lose its luminosity and look pasty, muddy, dull–worse, it would crack. 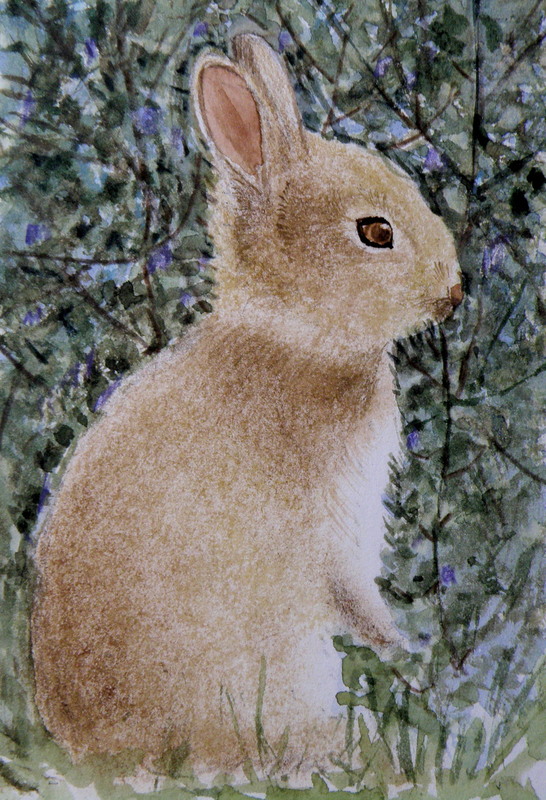 Watercolour pigment only works when the paper beneath dazzles through it and brings life to the pigmentation. In other words, watercolour as a medium is more the business of staining paper than it is a business of building up layers and coats of daubs, stipples, slatherings. THAT’S WHY CARE is required to not apply so many washes that the luminosity of the paper receeds and eventually provides no life at all. And that’s why the whites of the paper must be thoughtfully reserved and left untouched in key areas–the crests of waves; the moon; snow; clouds; a picket fence–and skill taken to paint AROUND these places to let the paper be the white. 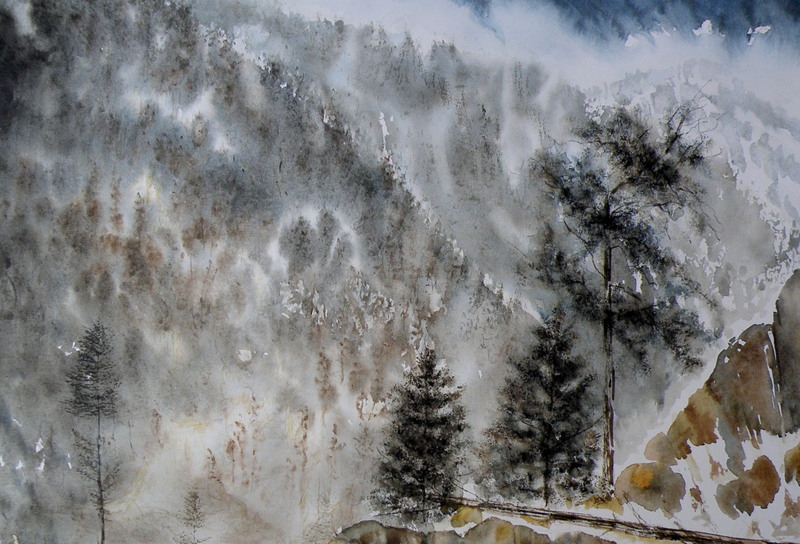 SO….a student of watercolour (me) learns early-on that (s)he will be a student of the medium for life–that mastery is illusive–and failures, many. A good piece is approached very thoughtfully, noting where the paper will be left to serve the function of white (pigment) and painted around. Then the student will also have to gather enough courage to apply exceedingly dark washes in one ‘go’, while maintaining a sense of secure, carefree animation in order to present an immediacy and liveliness in the final piece. 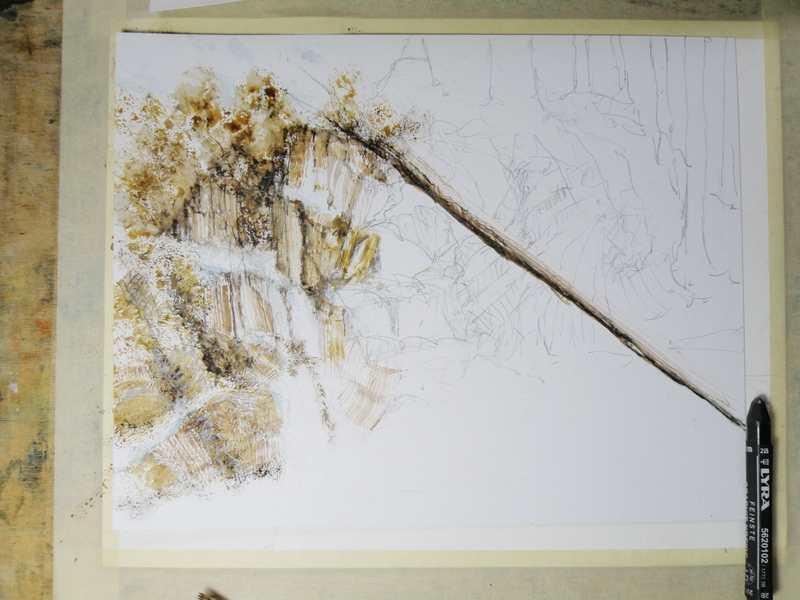 THE DEATHKNELL of a failing, dying work of watercolour is finicky overworking of areas, and a refusal to accept what happened when water joined pigment joined brush joined paper. It is NOT a medium for those who love to micro-manage or be in control. THE STUDENT OF WATERCOLOUR has to be more a Peter Pan than a child wanting to grow up–loving the thrill of what happens when ‘danger’ is courted, yet having the assurance that daring will win the day. However, that daring and search for adventure–on the surface of a good piece of paper–will only be pulled off if it is backed by enough experience to have a good hunch about what will happen when such-and-such is tried. ATTEMPTING what remains beyond one’s ability isn’t courting danger–it is ignoring it. Trying to fly without thinking happy thoughts will give a person a broken bone. Within the bounds of representational art–(i.e. 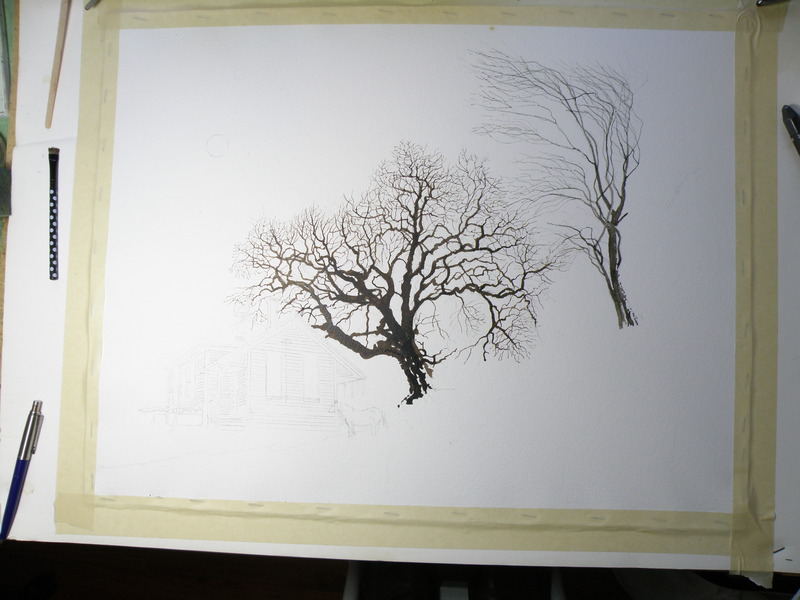 wishing to have a tree ‘look like’ a tree)–a painter cannot ‘pull off’ a landscape with lots of shadows if (s)he has yet to study them in some depth. Trying to do a scene which includes far far more than what one yet learned how to interpret is an invitation to frustration and wanting to give up watercolour for say, acrylics (oh, my). AND SO FOR MYSELF, I know by this time that I must confine my attentions to learning about how corn grows, what it feels like, looks like, behaves like, before I can throw my abandonment into rendering a watercolour of winter corn in January. Not only that, but I must also have studied the qualities of snow–the qualities of what a winter sun does to shadows of corn stalk–the blues, the purples. And only then can a learned abandonment bring about a possible reward. IT TAKES A LONG TIME to find the right paper, the right brushes, the right working pallet of colours, the right approach and the right subject matter. Knowing what can be done when paper is sopping wet–and what can’t–depends on who made the paper, how thick it is, how textured it is, how stretched it is, how quickly it will dry. Knowing when to wait until the paper is exactly wet or damp or dry enough to throw one’s energies at it, comes (usually) through ruining (many pieces of) good paper. 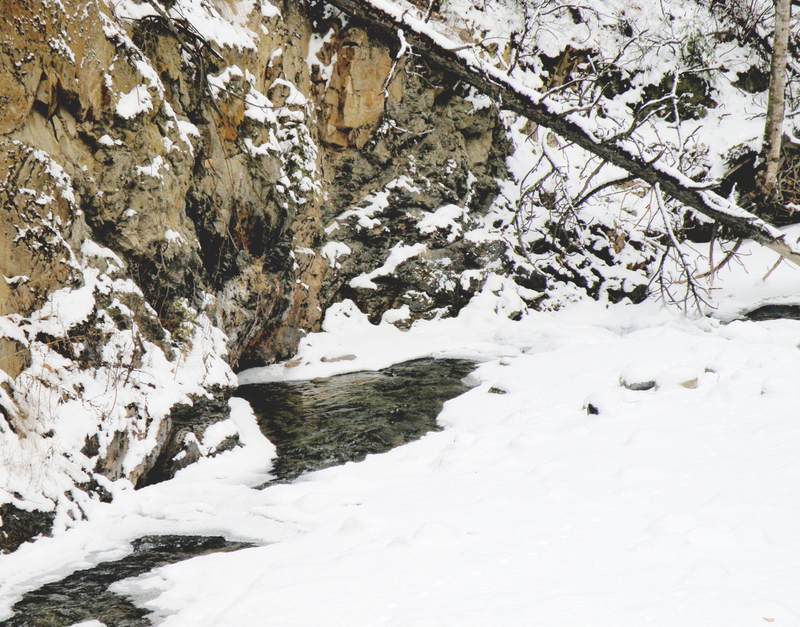 HERE IS THE LATEST DEVELOPMENT of the subject of Jamieson Creek in a February thaw….. TOMORROW will (hopefully) provide a photo of the finished piece! THIS TIME around, a horse was to be included, which meant it could not be a nocturnal scene, as that would be an odd addition to a night painting. The choice was made to have only a single horse, even though horses are most often seen in pairs or groups, being a social animal….. 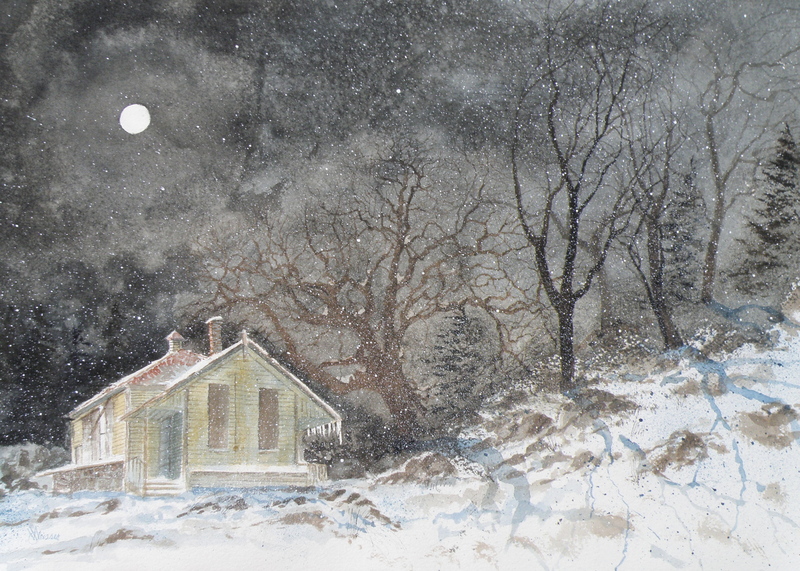 THE FINISHED piece–“Abandoned Schoolhouse, Pritchard”. 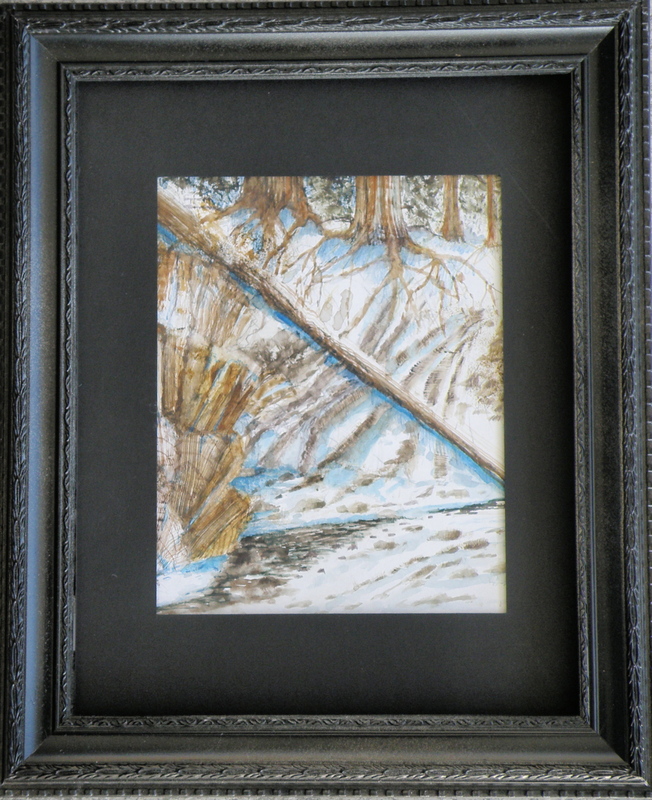 The rocks needed darkening and definition. Pines were added. 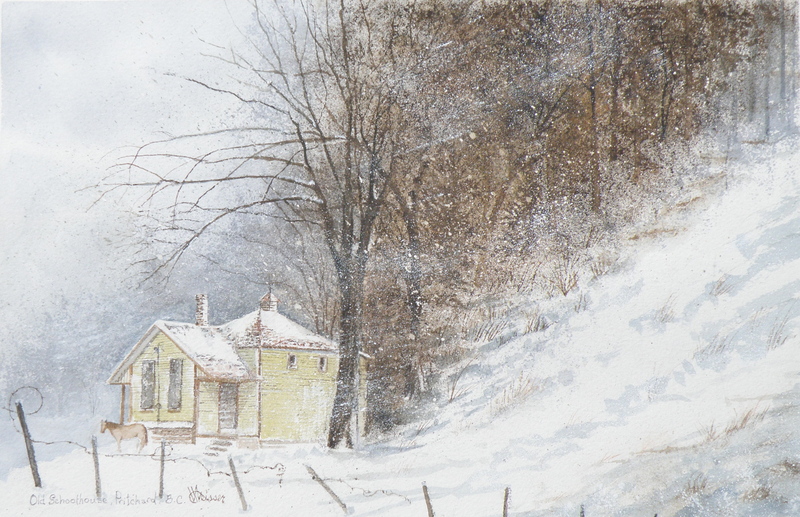 Spattering of snow was used to unify the whole and add a feeling of movement. 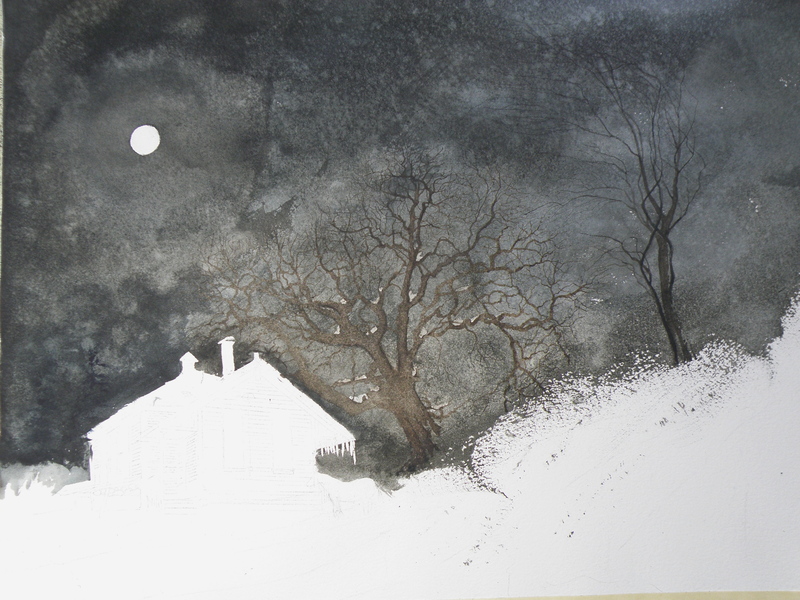 THE MOON and schoolhouse roof were masked, then a wash applied in the sky areas. Once done, a decision was made to next eliminate the horse, it becoming an unintended focal point if left in. 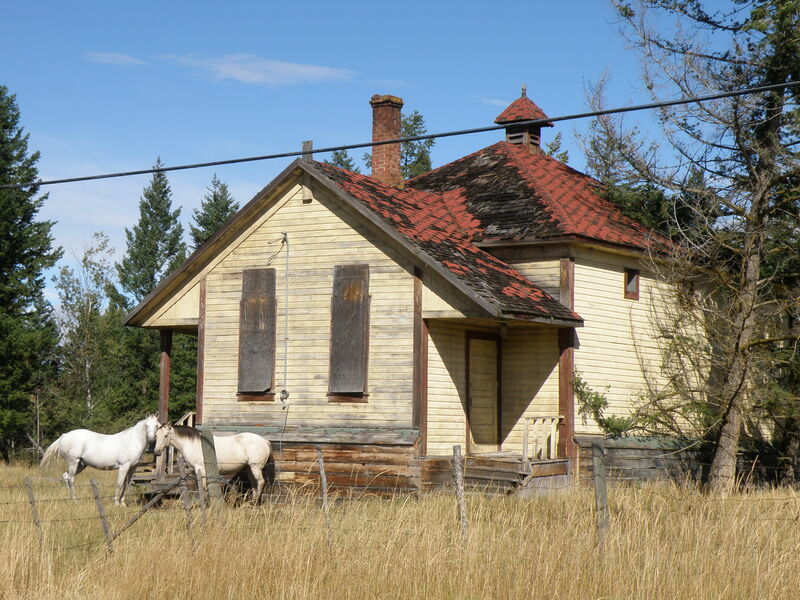 (A lone horse standing at night in front of an abandoned school in bitter cold would be incongruous). 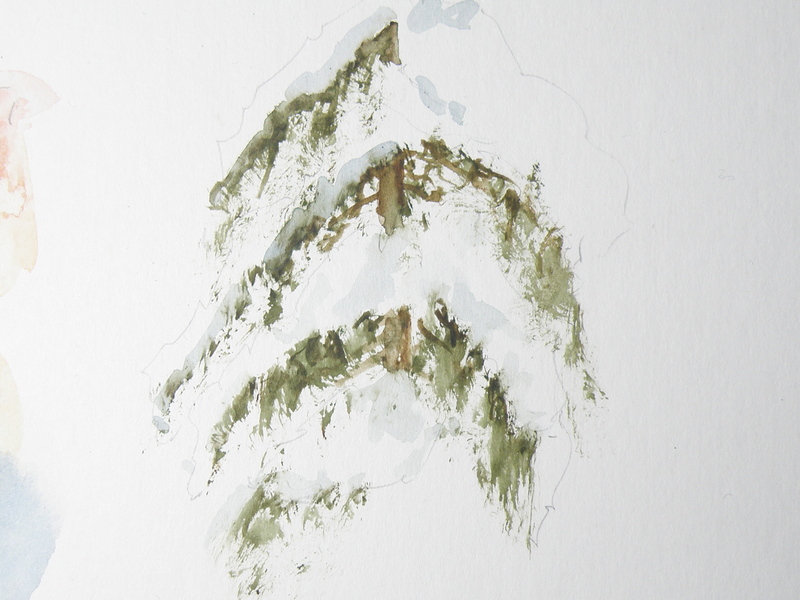 TREES are painted in very dark and the watercolour pigment tempered a bit in order to have it resist being completely taken away by an overlay of secondary wash.